Our clients are the very best! We take so much pride in our relationships with them and will happily refer you to their products and services. Since 2008, we’ve been providing them with the very best technology solutions at the very best prices. As you can see, we have the expertise to provide solutions for a variety of businesses including; HVAC, Real Estate, Moving Companies, Health Care, Dental, Hearing Health, Accounting Services, Fire Arms, Mortgage, Photography, Manufacturing, Waste Management, and Law Firms. We also serve our residential customers. As you can see, they dot the Phoenix Valley. That’s not all though, they also dot the United States and well as around the world. We highly recommend these businesses for the various products and services they provide! A Quality HVAC, HVAC, Plumbing & Electrical Services in Arizona. All My Sons, Moving & Storage Services in Arizona. Anteater Exterminating, Pest control services in Arizona. Arisa Water, Water Treatment Products & Services in Arizona. Alki Photography, Photography Services in Arizona. bCaptured Photography, Photography Services in Arizona. Cullimore & Coleman Law, Law Firm in Arizona. Curtis Farnsworth CPA, Tax & Accounting Services in Arizona. Dignity Memorial, Funeral, Cremation, and Cemetary Services in the USA. Full House Realty of Arizona, Premier Real Estate Services in Arizona. Holly Azouz, Real Estate Services in Arizona. Home Care of Arizona, Home Care, and Assisted Living Placement in Arizona. Gardenscape Sales, LLC, Management Consulting Services in Arizona. Realty One Group, Real Estate Services in Northern Arizona. Jackson Hewitt, Tax Services in Northern Arizona. Leggett & Platt, Diversified Manufacturing Services in Missouri. Mingus Mountain Real Estate, Real Estate Services in Arizona. OnSite Care Clinics, Primary and Preventative Health and Wellness Services in Arizona. Puget Sound Moving, Home & Office Moving Services in Washington. Real Living Property For You, Premier Real Estate Services in Arizona. Rock Your Glock, Glock Weapon Customization, Parts & Accessories in Arizona. Superior Growers, Pepper Grower and Shipper in Nevada. SmartBlonde, Novelty License Plates, Key Chains, and Signs in Arizona. Stellar Home Services, Water Heater Repair in Arizona. Structure Osteopathic, Osteopathic Manipulation & Medicines in Arizona. Taylor Waste, Residential Trash Collection Service in Arizona. VIP Mortage, Mortage Company in Arizona. Vortant Technologies, Design & Engineering Firm in North Carolina. Walsh Law, Law Firm in Calgary, CA. Wedgewood Weddings, Wedding and Banquet Services in the USA. 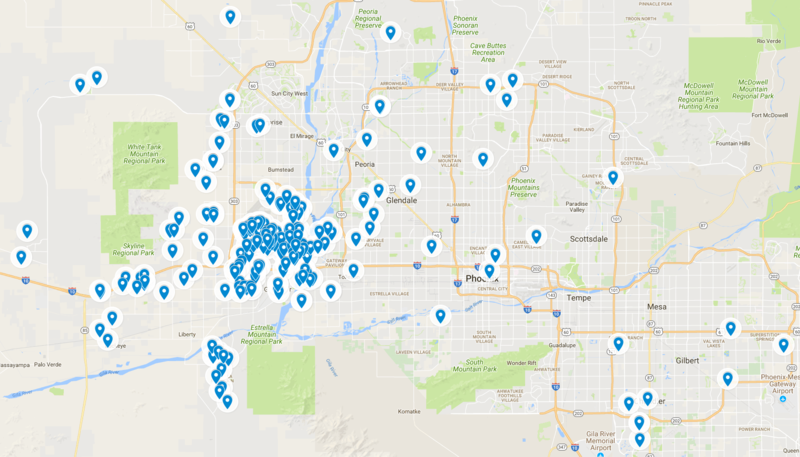 West Valley Phoenix Homes, Real Estate Services in Arizona. Western Environmental Liner, Water liner products, and services in Arizona.